I have never before ventured into the world of philosophy. Although I have been curios at times to know more about it, I never got to read a book on the subject. I was actually prompted to read Zen and the Art of Motorcycle Maintenance by a quote in a Paul Graham essay, then after seeing some tweets from others that have read it, I had to give it a try. 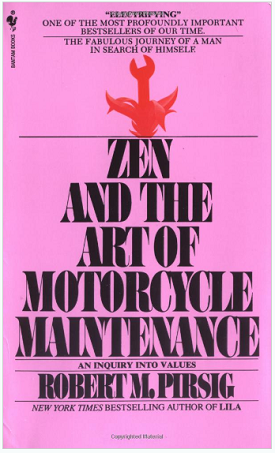 Zen and the Art of Motorcycle Maintenance was a very long read, but I found it thoroughly thought provoking. It definitely got my mind thinking and asking questions even more than it usually does while reading. The timing of reading the book was also a happy coincident. Spending the ski season in a small BC ski town, and embracing the mountain lifestyle, was the perfect setting for me to read this 1970s’ classic. It helped me think about what a quality life would really mean for me and my family, and where we are most likely to find it. The book tells the story of a motorcycle journey through the North West United States, while on the road trip the narrator takes you on an intellectual expedition of discovery into philosophy. He asks some fascinating questions about quality, technology and education. It also gives insight into the narrator’s struggles with mental illness and his relationship with his teenage son. As many in my generation, my idea of technology is sometimes limit to what we experience today. So when he talks about how technology changes the world in a book written before I was born, it serves as a reminder that technology transcends our lifetimes. The way he talks about working on a motorcycle in the book reminds me what great cricket batsmen always say they try and do while batting. To live in the moment, they look for that state of mind where you don’t think about anything else than the next ball you have to face. This ability to completely embrace in what you are doing is something I want to work on. Zen and the Art of Motorcycle Maintenance was also the first book in a long time, maybe ever, that I have read written in the first person. As the author explains in the introduction to this edition, that limits the reader to the narrators view of the world. After finishing the book, I had to read the introduction again. This got me thinking how the same limitations apply to own thoughts and the way we view the world. I can see how Zen and the Art of Motorcycle Maintenance became a classic. Take the time to read it, you will not regret it. This entry was posted in Book Reviews, Lifestyle Books, Reviews on 2013/04/23 by Justinus.